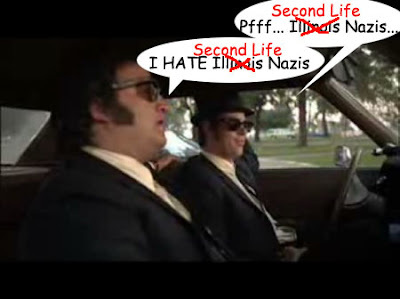 I've written before about my dislike of Second Life (perhaps now that they've open sourced the client someone will fix their crappy renderer), but that doesn't mean I don't find all the happenings therein to be fascinating. This occurrence is no exception. 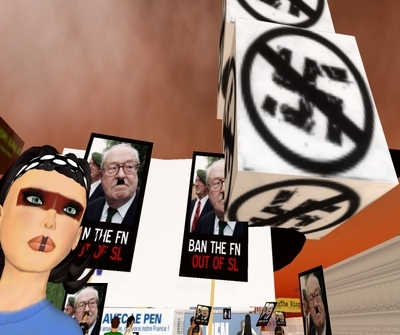 From Wagner James Au (via BoingBoing), on a French far-right political party setting up shop in SL, and the resulting political protest, which escalated to violence of a very surreal nature. "And so it raged, a ponderous and dreamlike conflict of machine guns, sirens, police cars, 'rez cages' (which can trap an unsuspecting avatar), explosions, and flickering holograms of marijuana leaves and kids' TV characters, and more. By California time, the battles often culminated at 2am, 3am, and even later into the small hours of the American clock, when Residents in Europe are most active. So amid the exchange of salvos, the chat log was choked over with pro and anti-Le Pen curses, most in French. And when the lag was not too overwhelming to stream audio, the whole fracas was accompanied by bursts of European techno." It's a fascinating read. Go check it out.